The Converse Blog: WKU in Converse? So last night I saw some pictures of Western Kentucky University's Fashion show announcing their apparel deal with Russell Athletics. 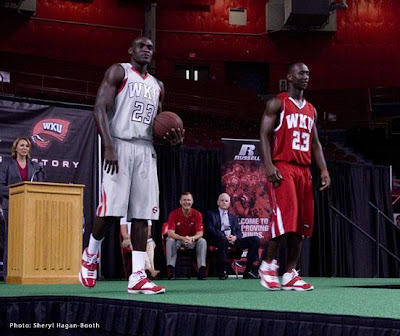 The interesting thing about this picture, featuring the new Men's Basketball jerseys, is the shoes they are wearing. These are the white/red colorways of the Converse 099's. Now this doesn't mean that WKU is going to be wearing Converse, in fact I've heard the contrary from an inside source at WKU. My source told me that they will be going with Nike again this year. However I am still excited and wanted to share the photo with everyone. Hopefully this is a sign of things to come. Could Converse be returning to the NCAA, only time will tell.